The Tortoise is a British tier 9 tank destroyer. The A39 Tortoise is the heaviest and last of the slow and heavily armored "AT" tank destroyers in the British line. It's a great leap forward from its predecessor, the AT 15, mainly due to its extremely accurate, fast-firing, and powerful 120mm cannon. and greater protection that even rivaling several tier 10 tanks. The Tortoise, just likes its name. it is extremely tough. it has a very large hitpoint pool. and very tough overall armor that, combined with the 120mm gun (which had second highest DPM in the game), makes this tank became one of the strongest opponent to face in tier 9 or even tier 10 match. But, also just likes its name. 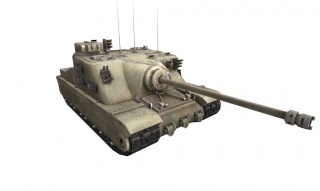 the overall slow speed can make this tank vulnerable from encircling by agile opponents. 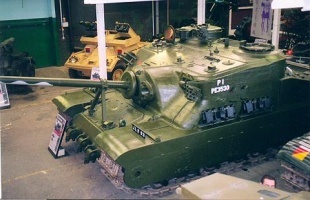 Compared to its tier 10 counterpart; The FV217 Badger. It has more raw armor values than the Badger which provides more decent protection from HE shots and SPGs than the Badger, although its speed is fairly slower than its counterpart. 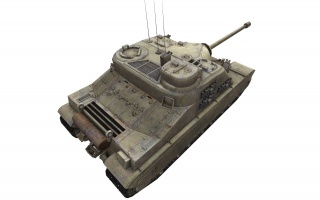 Overall, the Tortoise is one of the only few tier 9 tanks that were regarded as a "Tier 9.5" due to its top stats. with proper use of its rapid-firing gun and well-rounded armor, it can easily prove its worth and striking fear into anyone who dares to oppose it. The Tortoise leads to the FV217 Badger. - Second highest DPM in the game with the Top gun (after the FV217 Badger). It can also fire HESH rounds, which have decent penetration and can deal decent damage against enemy LTs or MTs. - 4th largest HP pool out of all tier 9 tanks (2000). - As with the AT 15, traverse and elevation arcs are massive and allow for angling of armor during a fight or "hull down" like tactics. - Very thick frontal armor at 270-300mm effective on most place, overall armor is more reliable than FV217 Badger. combined with wide gun arc allowing it to angling the hull more effectively than its Tier 10 counterpart. Its gun mantlet is also impenetrable. - Great accuracy and quick aim time. - Crew and modules are spaced, so it´s hard to knock them out. - Slow and low maneuverability. Vulnerable to artillery and flanking. - Loader (located in machine gun turret) often dies. The Tortoise is a fortress on tracks. It is capable of bouncing shots even when not angled, ricochets even gold tier 10 shells when angled properly. The high thickness of armor makes it a feared enemy. After 9.21, The Tortoise received massive armor buff that makes this vehicle can be played as "Assault Tank" like what it was meant to be. It can take many hits from enemies and returning fire with its fast firing gun. but, just likes the rest of the AT brothers. the Tortoise sports a large machine gun turret that, although it's tricky to penetrate, it's still remains annoying weakspot which most shots that penetrate it often injuring the loader who resides there. To maximize Tortoise's protection, angling is a must. With very good side armor and wide gun arc, it can bounce almost every shots from enemies unless they were aiming at machine gun turret. if you feel that enemy aimed at your "tumor", try "jiggling" your tank to make enemy shots missed or hit at impenetrable part. or try "peek-a-boom" by hiding your tumor behind the cover and to expose only raw & thick armor to absorb enemy shots. The extreme accuracy, and fast reload of the 120mm ensure you are a constant threat to enemy tanks up close or afar. In close quarters even the relatively slow hull traverse of 22° is more than enough to, for a time, prevent tanks from encircling you when given ample warning thanks to the massively wide traverse angle of the gun. With good aim you can easily track tanks while dealing solid damage, and even keep them tracked if they have not yet trained in repair, or have already used their repair kit. The accuracy of the gun means tracking is a very viable option that you should practice frequently (though this is the case with all tanks) to trap tanks in the open for your teammates to focus down. If you can reload quickly enough, keep them tracked and watch as they helplessly melt away at the combined fire of your team. Overall, this vehicle can be played both aggressively or defensively. You can help the team to lead a charge, covering fire as second-line attacker, or defending strategical points. Your high rate of fire and good accuracy means you can easily out-DPM enemy tanks, and with a team backing you up you can easily smash through, wrecking everything you see and lead a team to victory. From the AT 15. you should have the 20-pdr gun and Top radio and can mount it right away. If you have played the heavy tank line prior to this, you may have the engine as well. If you played the turreted British TD line. 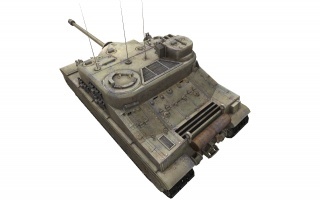 you should have the 120mm gun unlocked, as the 120mm is the default gun of the FV4004 Conway. In case if you didn't research the 20-pdr gun yet. you should get it immediately. 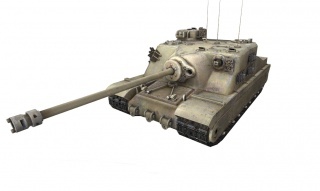 You can mount the top gun without the suspension upgrade, and this should be your priority as the 20-pdr no longer cuts it against tier 10 opponents. After getting the 120mm gun, you can either focusing on getting tier 10 or researching engine to boosting mobility and/or research new suspension to equipping equipment. In the early part of 1943 the Allied forces anticipated considerable resistance in the projected future invasion of Europe, with the enemy fighting from heavily fortified positions such as the Siegfried Line. As a result, a new class of vehicles emerged, in the shape of Assault tanks, which placed maximum armour protection at a higher priority than mobility. 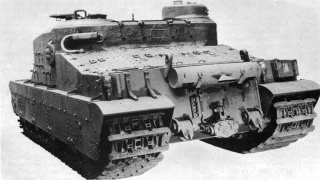 Initially, work was concentrated on the Excelsior tank (A33), based on the Cromwell tank. There was also a program to upgrade the armour of the Churchill tank. 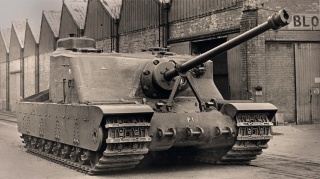 For similar work in the Far East, the Valiant tank (A38), based on the Valentine tank was considered although weight was specified to be as low as possible. The Secretary of State for War and the Minister of Supply issued a Joint Memorandum in April 1943 which gave a vague specification for an Assault tank, classing it as a special purpose vehicle to operate in heavily defended areas as part of the specialist 79th Armoured Division. The Nuffield Organisation responded with 18 separate designs (AT-1 through AT-18) drafted between May 1943 and February 1944, each design larger and heavier than the last. By February 1944 design AT-16 was complete and was approved by the Tank Board who proposed that month that 25 be produced directly from the mock up stage without bothering with a prototype, to be available for operational service in September 1945. An order for 25 was placed by the War Office and work was begun. Following the end of the war the order was reduced and only 6 vehicles were built. One example was sent to Germany for trials where it was found to be mechanically reliable and a powerful and accurate gun platform, however at a weight of 80 tons and a height of 10 feet (3.0 m) it was extremely slow and proved difficult to transport. 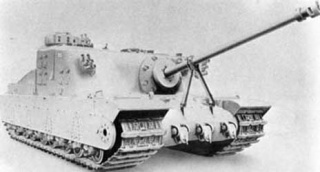 Since the Tortoise had a fixed casemate superstructure instead of a turret, it can be classified as a self-propelled gun or an assault gun and not a tank. The crew included a commander, driver, and gunner, with two loaders for the 32-pounder gun and two machine gunners. Internally it was split into three compartments, the transmission to the front, the crew in the center and the Rolls-Royce Meteor engine at the rear. The suspension consisted of four bogies on each side each of the hull. 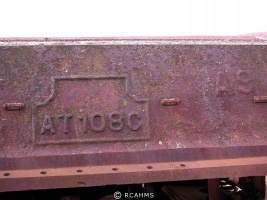 Each bogie had two pairs of wheels, with each pair linked to a transverse torsion bar. The Merritt-Brown transmission was fitted with an all speed reverse, giving approximately the same speed backwards as forwards. The Ordnance QF 32 pounder gun design was adapted from the British 3.7 inch anti-aircraft gun. The ammunition used a separate charge and shell, the latter a 32 pound (14.5 kg) armour piercing shot (APCBC). In tests the gun was successful against a German Panther tank at nearly 1,000 yards. The 32-pdr gun was mounted in a power-assisted limited traverse mounting; rather than being mounted on the more traditional trunnions, it protruded through a large ball mount in the front of the hull, protected by 225 mm armour. To the left of it was a Besa machine gun in an armoured ball mount. A further two Besa machine guns were mounted in a turret on the top of the hull to the right. One of the six prototype Tortoises constructed of mild steel has been preserved at the Bovington Tank Museum in Bovington, UK. The vehicle is in running condition. A 2011 overhaul saw it running under its own power for the first time since the 1950s. 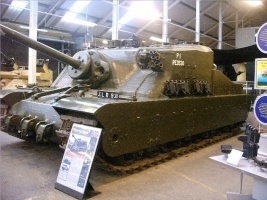 It was shown to the public in June 2011 at Tankfest 2011, the Bovington museum's annual display of running vehicles. A Tortoise, without its gun, lies on the Kirkcudbright military training area near Kirkcudbright, Scotland. 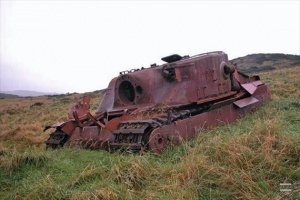 Other damage to the tank and the designation of the Kirkcudbright training area as a Site of Special Scientific Interest mean that removal of the Tortoise to a museum is now unlikely. Its only primary armament is the OQF 32-pdr which it still carries today. The 20-pdr and 120 mm gun configurations are fictitious. The A39 Tortoise actually has 7 crew members, in which the machine gunner is missing, though the game has no such crew position. The Royal Armoured Corps recognition mark (or flash) was only used until mid-1942; the Tortoise was first built in 1945. This page was last modified on 17 April 2019, at 18:51. This page has been accessed 272,950 times.